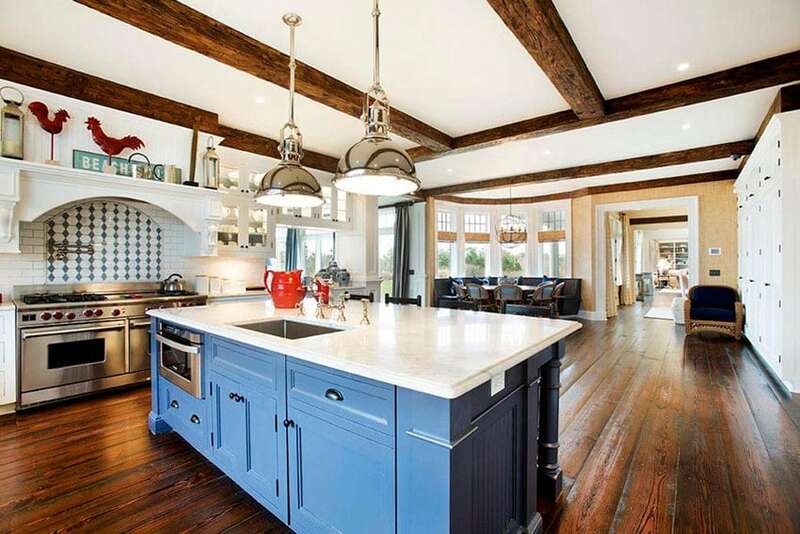 This gallery shares beautiful open floor plan kitchen ideas for an assortment of design styles. 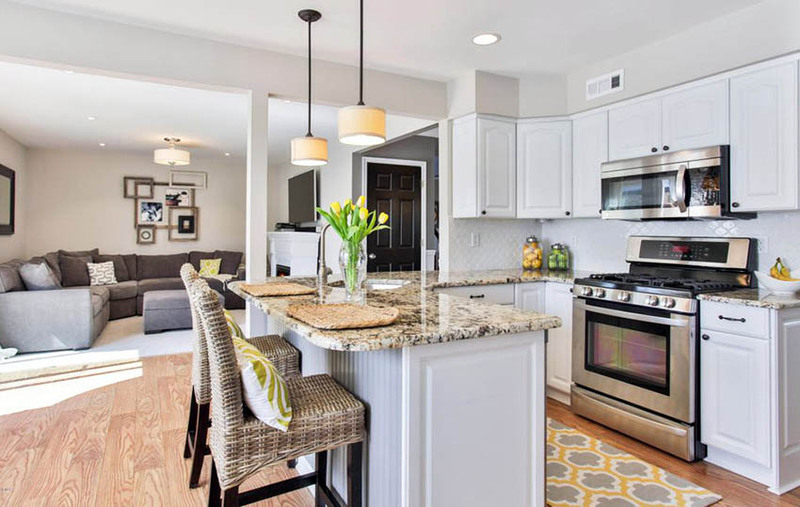 Open floor plans have continuously been popular because of the limited spaces available in homes and apartments. As real estate prices go up, houses and apartments also keep on getting smaller to compensate. 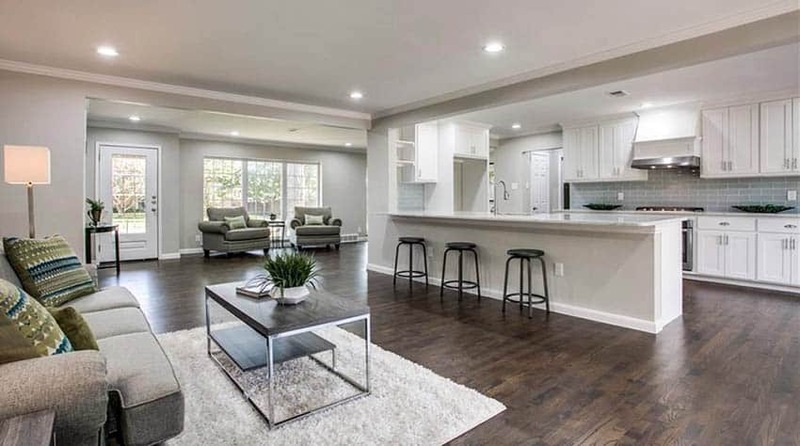 Open floor plans benefit small spaces the most, but even bigger floor areas can opt for an open floor plan, as it offers ease of access, brighter and bigger-looking spaces. Open plans are usually applied on kitchens, wherein it could be in the same space as the living area or the dining area, or even both. 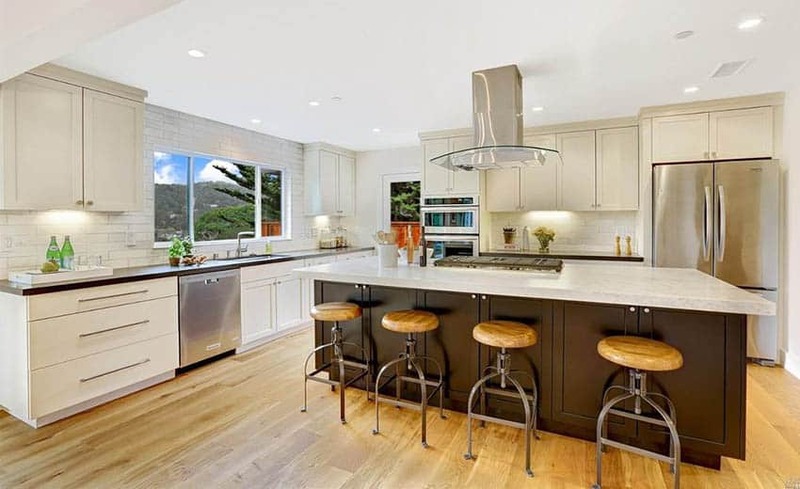 It’s perfect for those who love to multi-task and those who love to cook and entertain, as the kitchen will probably be the center of your home activities. 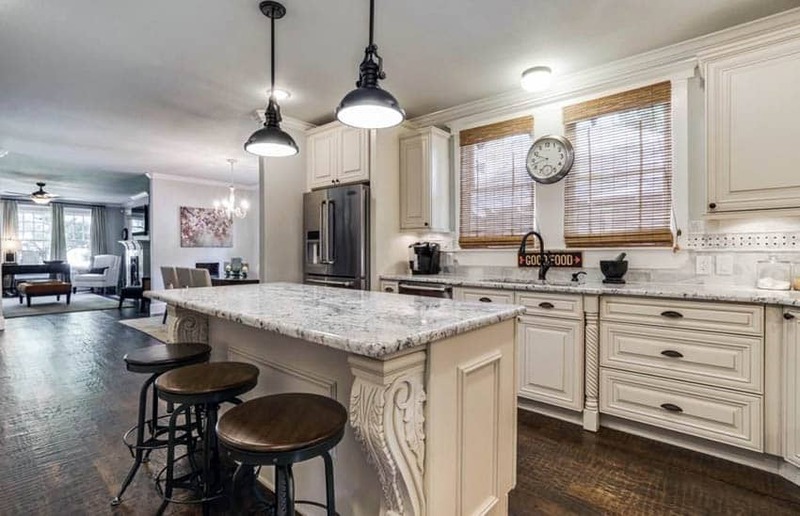 The open concept kitchen above has a transitional style all-white kitchen which has traditional style kitchen cabinets, combined with modern fixtures and furnishings for a very fresh and modern look. It also features a skylight which provides natural illumination during daytime and naturally setting the kitchen as the focal point of the space. Keep your overhead open – especially for the kitchen island, it is best to keep the space above it open to avoid obstructing the visual continuity of the space. Allow only your island counter to separate different spaces in your plan. 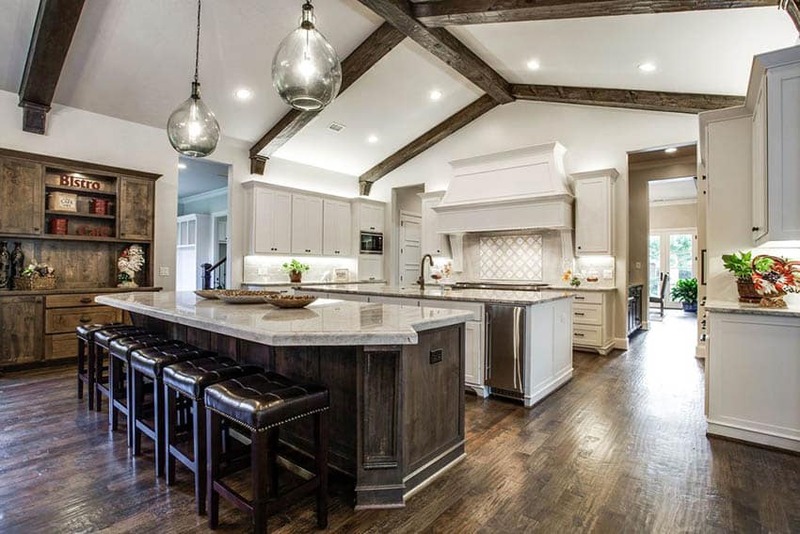 Add accent lights – if you have a kitchen island, especially, and if you want to make it your focal point, adding simple accent drop lights above the island counters is a good idea. Just remember to keep it simple and to not add too much to avoid obstructing the view. Maximize the space – plan you kitchen strategically in order to save space. 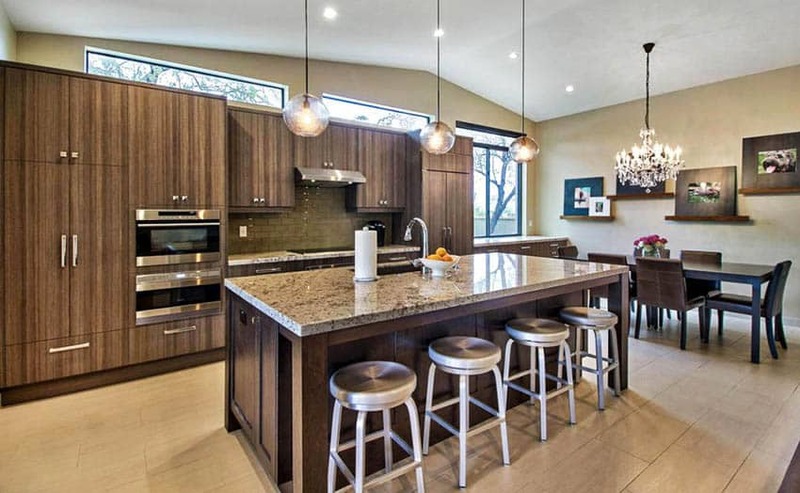 Multi-function features are especially favored, such as island counters with storage space & counter stools for dining. Open plan kitchens often use kitchen islands to visually divide or demarcate the kitchen area from the other areas in the open concept space. 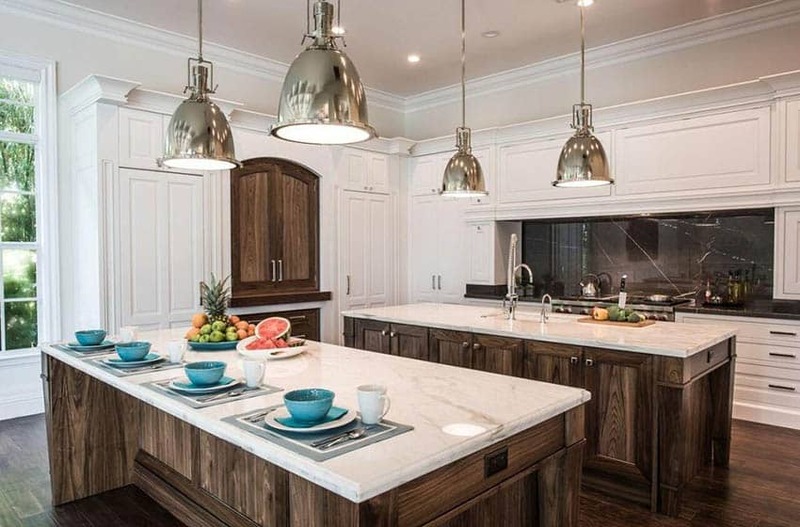 An island will also enable one to maximize the functionality of the space by allowing eat-in dining, extra countertop space, built in appliances, a cook top or a sink. In this example, the kitchen island uses a Mahogany base to make it stand out from the white wall cabinets & to further emphasize the visual demarcation. Two types of quartz kitchen countertops are used with one in black and the other in white to create visual interest and enhance the contrast of the design. Placed right at the center, this kitchen is open/accessible on three of its sides, making it the focal point of the whole open floor plan. Because the kitchen is placed at the center of the space, the kitchen island rounded the outer corners of the countertop not only to soften the edges, but also to make it safer as traffic flows around it. This layout style is an unusual choice for smaller spaces, but for those with enough to spare, could be a great idea, especially if multiple persons use the kitchen area a lot. The French style wall cabinets in this kitchen are all white, making the two kitchen islands with natural teak wood case stand out even more. For this open plan kitchen, two kitchen islands were used – one is mainly for food preparation and storage, and the other is to help separate and transition the kitchen to the other areas of the house. This is why the outer kitchen island has an oak finish similar to the display shelf, instead of white like the rest of the kitchen. 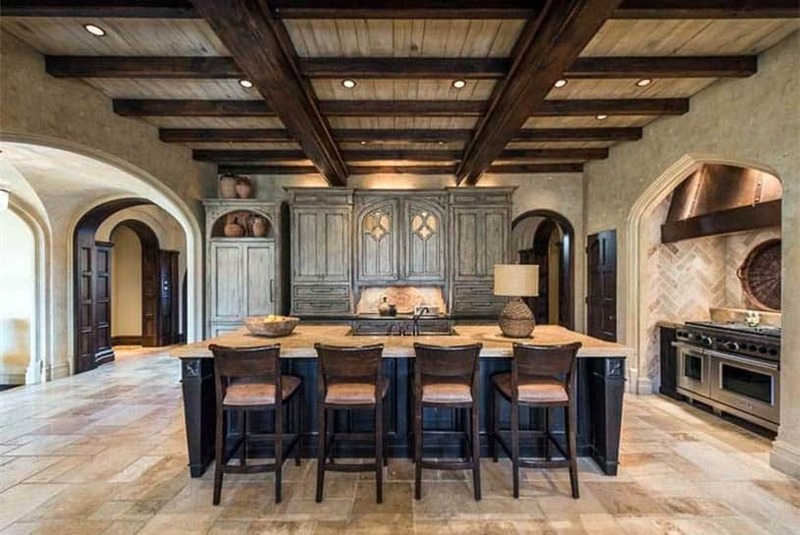 Gothic style kitchens don’t often use open plan, but this one does. It also uses a kitchen island to separate the kitchen from the other areas of the house. No overhead racks or storage were placed above the kitchen island to keep the visual lines clean/flowing, to retain that “open” feel. Those whole like the idea of extra counter space that doubles as a dining area would love kitchen islands, but not everyone has enough space for it. For smaller spaces, you can still have a kitchen island, but smaller, just like this example. It uses a narrower kitchen island to compensate for the small space. 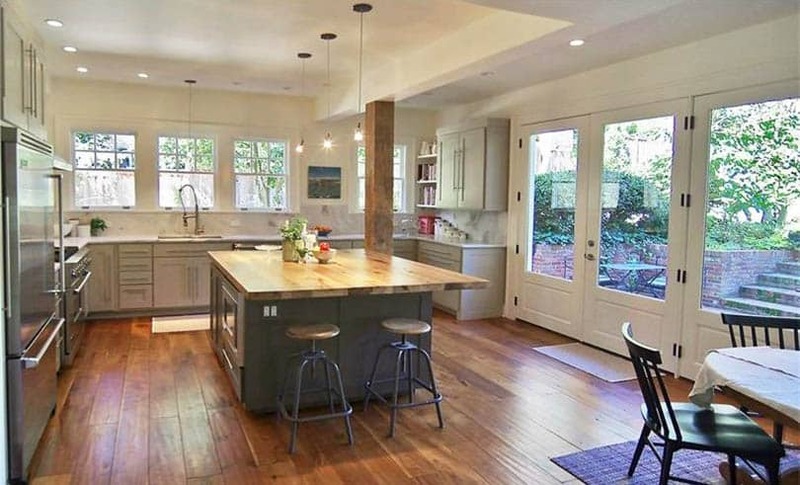 Quite uncommon, but those with enough space can pull of a kitchen with three kitchen islands. 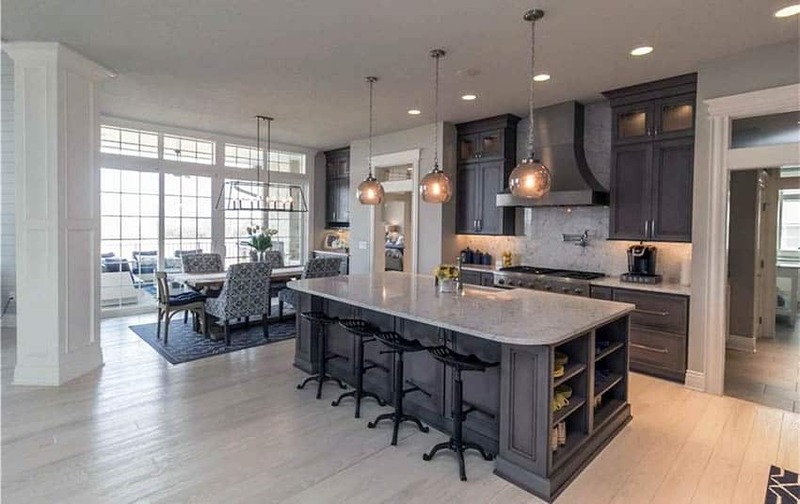 This example compensates for the lack of wall cabinets/storage, by adding 3 kitchen islands – two are parallel, mainly used for storage and extra surface for food preparation because there’s barely any on the wall counters, and the other is mainly for dining and space demarcation. 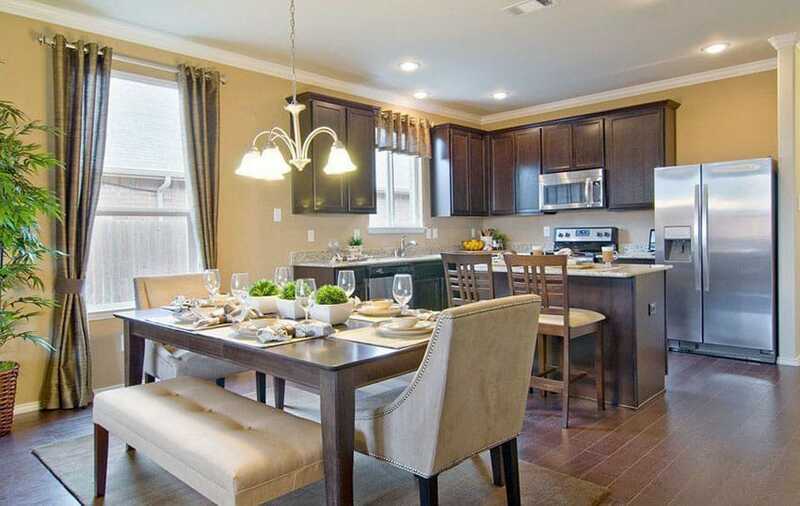 Having the kitchen placed adjacent to the living room is especially a gem for those who love multi-tasking. This set-up allows you to be able to prepare meals while entertaining guests in the living area, or even to simply monitor the activities in the living area for those who have small children. 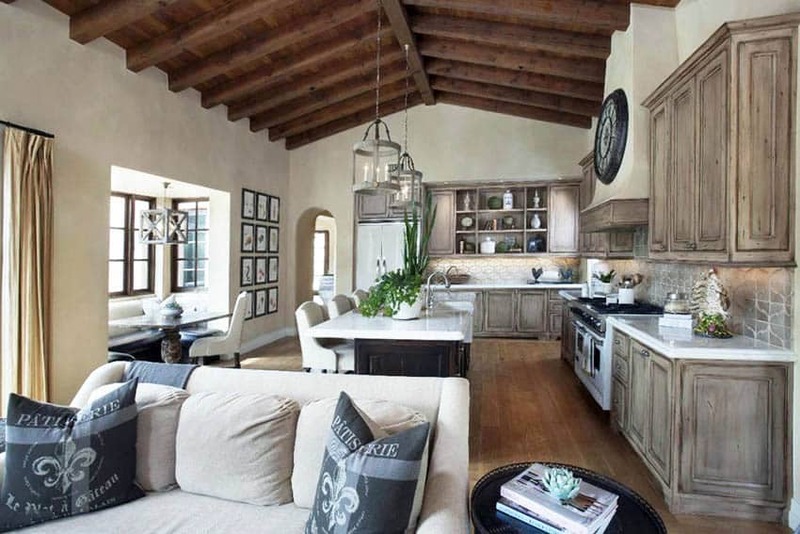 This traditional kitchen features an open concept that flows in to the living area. A large island with seating as well as a window dining nook provide multiple dining opportunities. The rustic wood cabinetry is paired with a white honed marble countertop and beige Arabesque backsplash tile. If you have a wall separating the kitchen from the living room, you might not have to tear down the whole wall to create an open layout. Similar to this example, you can just remove half of the wall, and the upper half of the other side, to be used as a low “wall” for the kitchen counters to attach to. 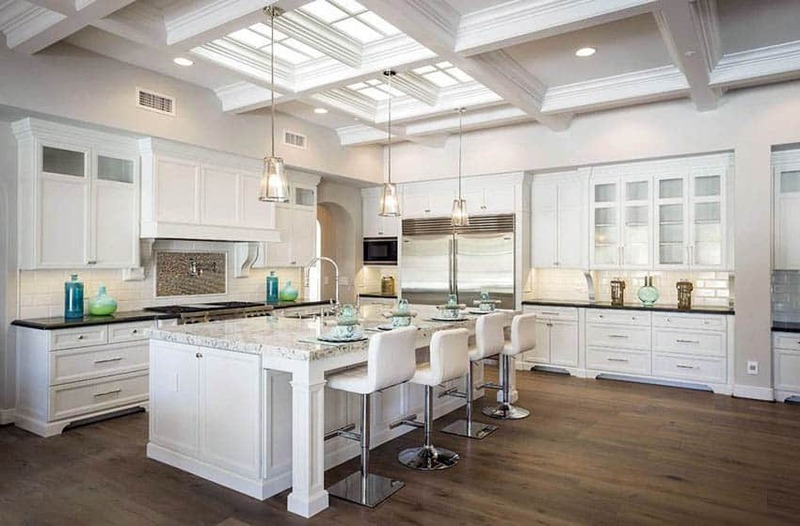 Open kitchens are most commonly attached with dining rooms, as it makes serving food faster and more efficient. In addition many modern families want to be in close proximity to family during meal prep making an area to sit essential. 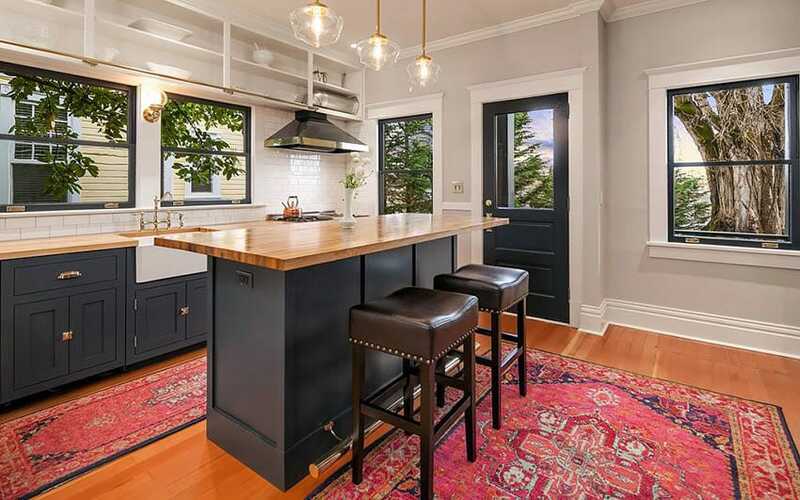 This large classic style kitchen is directly connected to the small dining area, and also utilizes its freestanding kitchen island as a bar counter area for dining. A simple, Scandinavian style open plan kitchen with dining table. 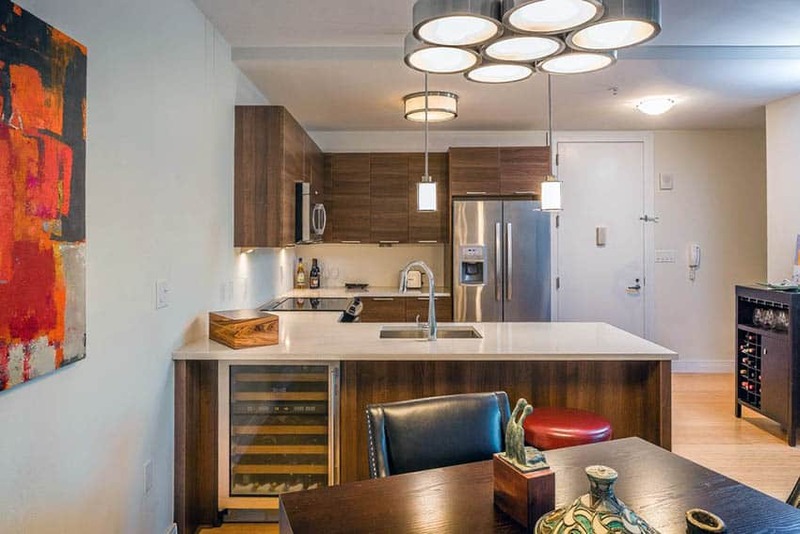 The room features clean, rectilinear kitchen cabinets with muted colors, combined with natural wood countertops and simple Scandinavian style furniture pieces. 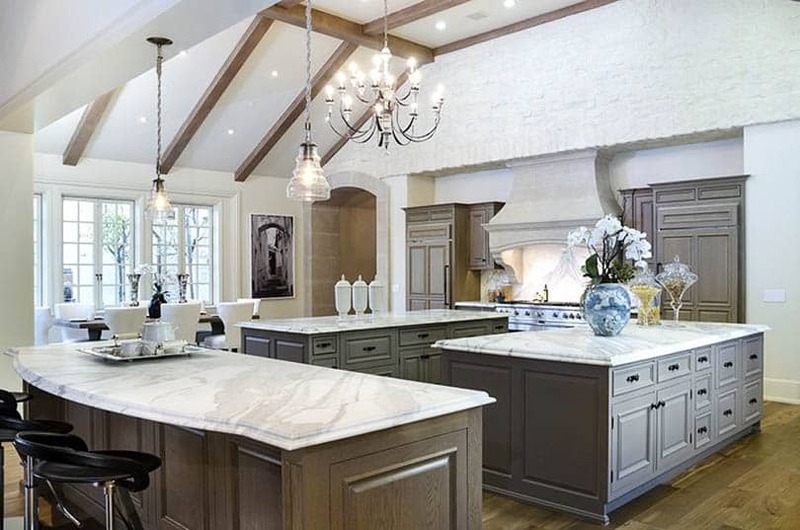 This is a gorgeous French provincial style open kitchen with a touch of rustic elements, that connects directly into a small, informal dining area by the bay window. The unique layout gives it casual, warm and homey vibe that perfectly matches the mood of the interior architecture of the space. This modern kitchen integrates the dining area into the plan with a unique approach. 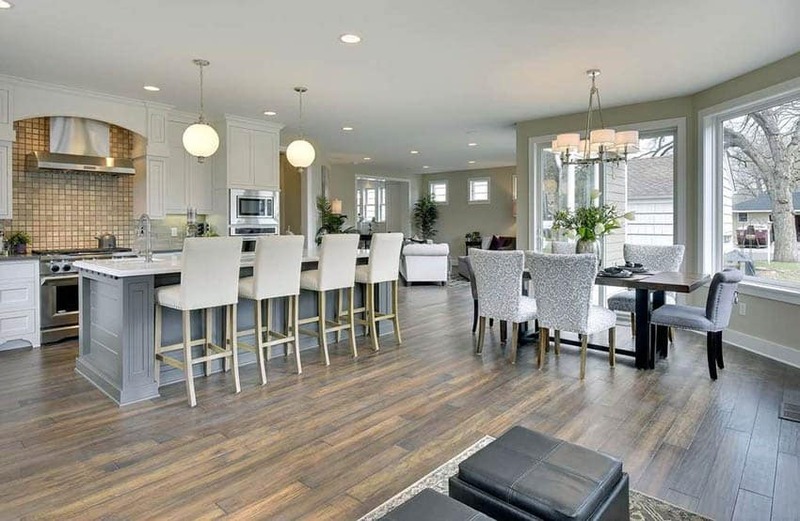 Usually, the dining area in open plan kitchens are made to be visually separated from the kitchen, but in this design, the dining area seems to be part of the kitchen instead. This was achieved because instead of placing the dining area in front of the island counter, it was placed right beside it instead. Additionally, you will also notice that under the window, instead of using a freestanding buffet table, it simply continues the modular kitchen cabinet bases to serve as the buffet cabinet storage of the dining area. With smart and efficient planning, it is also possible to fit in a small kitchen with an island and a dining area in one small space, as demonstrated by this example. By using a small kitchen island counter and a well-planned L-shape wall cabinetry, the space was able to fit in a small formal dining area which is able to accommodate up to 6 people. Using laminated modular cabinets, this modern open plan kitchen space was able to efficiently combine the dining area and the kitchen into one small space. One side of the U-shaped kitchen counters doubled as a bar counter that separates the kitchen from the small dining space. This modern transitional style kitchen has both the dining and living areas adjacent to each other, to create a good traffic flow. Because the structure also has a number of large windows, the open plan also allows natural light to reach most areas of the space, enabling you to have brighter spaces without the aid of artificial lights. Older houses usually have gorgeous solid wood floors which are hard to find and very expensive nowadays. However, they are usually finished with a darker color, which has a tendency to make spaces feel and look smaller. To compensate, you can opt to open up the partitions of your space to make it feel less cramped. This classic kitchen with cream cabinets is right beside the dining and the living area, and because the partitions were opened, the whole space looks and feels a lot more roomy.